Its not the healthiest burger , its not the cheapest burger nor the most expensive one , it does not have much magnetism as Carl's Junior burgers or Semabok burgers . At RM5.60 , I think its worth it lo . Even though people say that its shrinking day by day . Its super -- very -- seriously -- really -- reallyreally -- reallyreallyreally yummy . If you haven't taken a bite out of it , well , its worth starving yourself for a day to save up RM5.60 . If you had tried it , and you don't like it . Come to me . 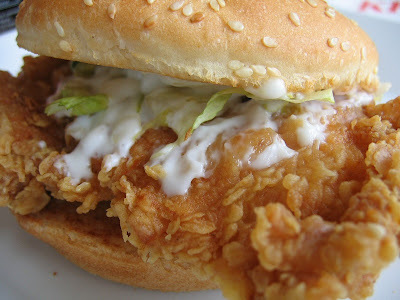 I'll tell you all the good things about KFC Zinger Burger . I won't rest until you say you like it ! Chua Shi Rui if bro didn't buy the pendrive , I would have bought you a Zinger burger . More worth it !